I picked this up at Kayo Books. They had a decent collection of Rabes at pretty good prices. This was one of the cheaper ones. I ended up finishing it at 2:30 in the morning after being awakened by my daughter. Soft ending, but some pretty intense and satisfying tough guy stuff the middle. A precursor to Get Shorty with the protagonist being an ex mafia guy trying to go straight in Hollywood who gets mixed up with one of his old colleagues who is now working a blackmail scheme with a big-time producer. 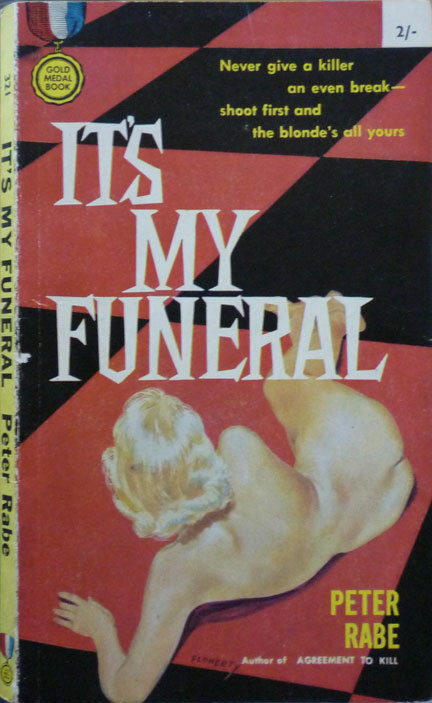 It's my Funeral did not put Rabe on the map, but it's a decent crime story from its period. Hmm, interesting, I just learned from Existential Ennui that the protagonist of It's my Funeral, career gangster Daniel Port, is a recurring character. He leads five of Rabe's novels! I maybe should pay more attention to see if that continuity is interesting. The character has potential for sure. Cheaper by the Dozen by Frank Bunker Gilbreth, Jr.
1/3 American, 1/3 Canadian, 1/3 Montrealer, when I'm not working for the planet and living my lucky life, I hang out on the internet and write about culture and language in Montreal, books and movies. I also rant on a wide range of subjects and try to do that here so my wife doesn't have to be the only one to suffer.